A Bold Claim: This is absolutely unlike any method you've ever been exposed to. Dan O'Day will share with you an exclusive system that took 20 years and cost $20,000,000 to develop. Do not order this CD if you are perfectly satisfied with "average" salespeople representing your company...or even "above average." Order only if you want to learn exactly how to attract the one or two people who will outsell the rest of your staff combined. Based on 20 years and $20 million of research & development by Chet Holmes - the legendary strategic sales consultant to over 50 Fortune 500 companies (American Express, Wells Fargo, Xerox, Dean Witter, Pac Bell, Merrill Lynch, Citibank) who ran nine separate divisions of a company for Charlie Munger (Warren Buffet's partner) — doubling each division's sales several years in a row...and establishing Chet Holmes as a sales legend. Dan O'Day will take you step-by-step through this foolproof process, in minute detail, to give you all the tools you need to find at least one sales superstar for your organization next week! Note: These methods are radically different than the "tried and not-so-true, hit-or-miss" methods traditionally used by broadcasters. They also produce radically greater results: fewer wasted interviews, fewer "bad hires," and an absolute certainty of finding at least one true sales superstar in your market. Wow! Listening to these ideas was like taking a thrill ride, I never knew what was around the next turn. This is a very Thought Provoking seminar and I can't wait to try the system out. We have struggled, for years, with hiring quality sales-people, but this seminar has made me open my eyes to new techniques that I truly believe will lead to better hires. 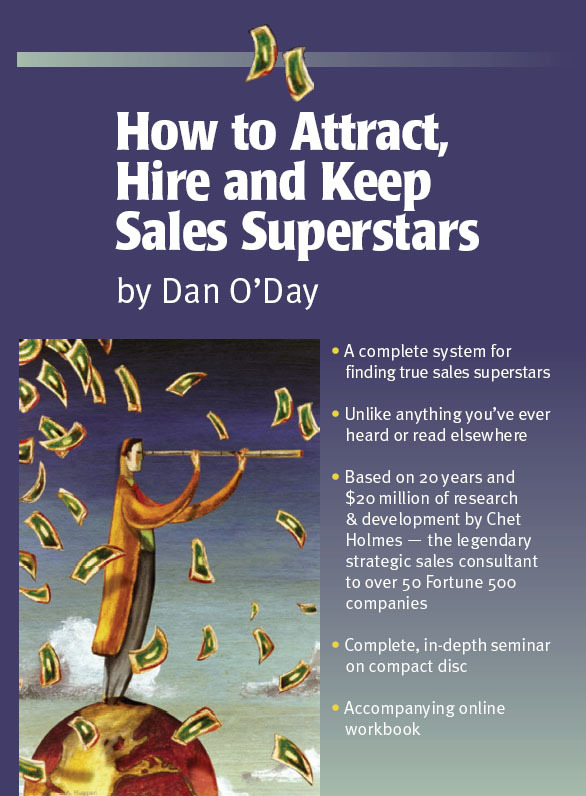 Click the button below to add the HOW TO ATTRACT, HIRE & KEEP SALES SUPERSTARS (audio seminar on compact disc) to your wish list.